Indo-Myanmar border, January 27 2009: Along with disappearance of border pillar 94 erected at Charoi village under Kamjong sub-division of Ukhrul district along the international boundary with Myanmar, the eastern neighbour has also claimed Charoi Khunou village as theirs. Even though the area around border pillar 66 erected at Molcham village in Chandel district is regarded as a disputed site between the two countries, Myanmar has been encroaching into the area. On the other hand, for the Assam Rifles and Army deployed along the international border with Myanmar, it remains a mammoth challenge to ensure security of the inhabitants. Under such circumstances, every household located in the border areas have been building bunkers inside their houses for their safety in the event of any gun battle between security forces and militants. These were observed by this reporter during an extensive tour of these villages located along the 350 kms long borderline with Myanmar starting from border pillar 39 erected at Singhat sub-division of Churachandpur district and covering villages along the international boundary in Chandel district till border pillar 129 erected in Chingai sub-division of Ukhrul district. During the extensive tour of these villages after the Somtal Operation where the security forces and insurgents are still engaged in gun fights, some villagers even asked this reporter if he didn't fear for his life. After the disappearance of border pillar 94 erected at Charoi village in Kamjong sub-division of Ukhrul district, Myanmar Army often come to nearby Charoi Khunou village with the claim that the area is within their territory, said some villagers while interacting with this reporter. They further informed that the joint effort of Indian army and local villagers to locate border pillar 94 proved futile last year. Charoi village has been totally deserted after the ethnic clash between Kukis and Nagas in early 90's, they conveyed. Since border pillar 66 erected at Molcham village under Khengjoi TD Block of Chandel district disappeared, over 100 acres around the spot where the border pillar was identified by the two countries as disputed area and no one was allowed entry from either side. But Myanmarese have encroached upon the disputed area and have been cultivating pine-apple, sugar-cane and banana over an area of 10 acres, informed the Molcham village chief. Talking over the matter with officers of the 10 JK Light Infantry stationed at Molcham, they said that the spot from where the border pillar disappeared has been identified. A border pillar may be re-erected any time there if the Govt directs them to this effect, they said. For the 26, 27 and 10 Sector AR and Army deployed in border areas in CCpur, Chandel and Ukhrul, it remains a mammoth task for the security personnel to contain insurgent activities or maintain law and order in these border areas. Even as the AR claimed to have driven off all UG elements after Operation Somtal, all households in villages along the international boundary have been digging holes insides their houses as a sort of underground bunkers, noting the possibility of gun battle between SF and UGs any time. Ear lier when gun fights broke out between SF and UGs, villagers used to flee to safer areas. But these days, the villagers feel more secure in their underground bunkers instead of running in the open field. When there was gun fight, the villagers called in their children and put them inside underground bunkers. At these border villages, empty, dilapidated houses earlier occupied by fled away villagers could be observed. It was also observed that no villagers residing in these border areas were allowed to venture outside once night falls. Security in border villages under Singhat subdivision of CCpur district, particularly Behiang area was very tight. Stringent and detail checking was conducted when this reporter went to this border villages. No person including media persons could get easy passage into the border villages of Ukhrul district. Security forces deployed in the border villages of Kasom Khullen etc conducted veirfication of each and eeery visitor meticulousy and asked details about the purpose of their visit. Villages located along the border with Myanmar in Ukhrul district like Wanglee, Skipe, Kamang Ashang Khullen etc face wildfire every summer which originated from Kabow valley and often consumed their properties including houses. The villagers made 'firelines' around their houses to protect themselves and their properties from such destructive wildfire. 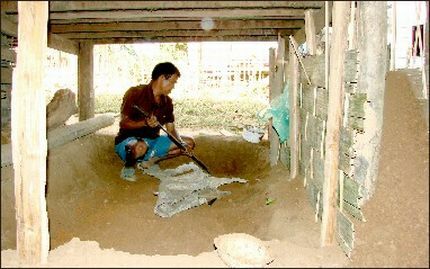 Sometimes Myanmarese Army wielding weapons intrude into Skipe village under Kamjong sub-division, conveyed the villagers.